Next Generation Stair Lifts – So, what might the next generation of stair lifts look like? What have the stair lifts manufacturers been up to from a development perspective over the past number of years? Are there any innovations in the stair lifts pipeline!! I’ll be honest, I’ve never seen a ‘Through Floor Lift’ in person, in use within someone’s house, but I have to say they are very impressive. They look a bit cumbersome, but are perfect for people who are wheelchair bound and if a stair lift can’t be integrated into a staircase. 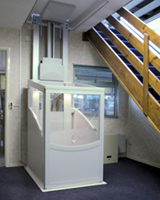 The Through Floor Lifts can be used in a standing up position, not just a seating position, and as you can see from the photo above, transfers’ people between floors. Really they are ideal for people in wheelchairs as the wheelchair user does not have to transfer from their wheelchair to a stair lifts. On a negative, you will need to set aside a bit of space for the through floor lift and there may be some structural work required. So, consult your stair lifts provider and also take advice from an occupational therapist. This video from a British Stair Lifts company really demonstrates the Through Floor Lifts perfectly. This is a really cool piece of software, which allow the stair lift customer to visualise their installation, before the installation has taken place! Brilliant not just for the customer but also for the Otolift’s sales rep! It’s always a little easier to sell something when you can touch or visualise it! Anyway, in the tech industry it’s referred to as ‘Augmented Reality’ technology. Again, if you need any advice regarding the best stair lifts solution for your needs and requirements, Jen and Jacinta (info@bmstairlifts.ie or 1890-837274) will happily go through your options and again consult your occupational therapist. Keep an eye out for our next blog post which will look into a few more exciting stair lifts innovations…..coming soon!